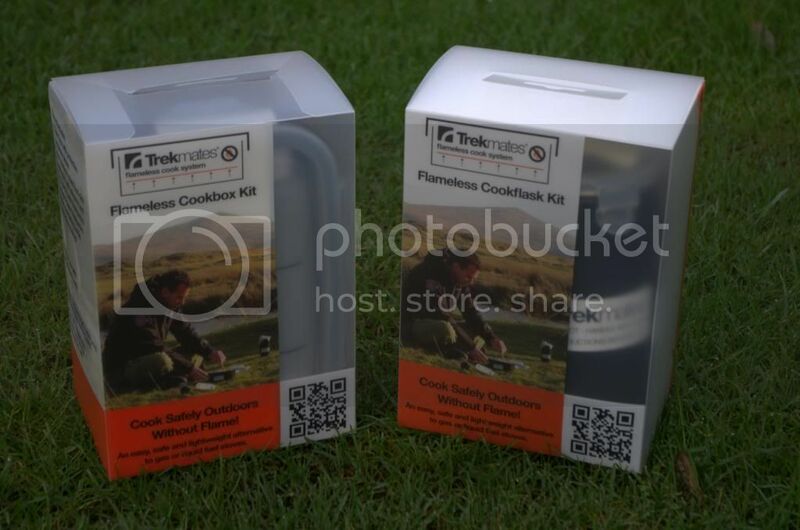 Having seen the adverts in the outdoor shops, I was intrigued as to how this new flameless cook system would perform and recently had the opportunity to try them both out. First the Flameless Cookbox. So what do you get? 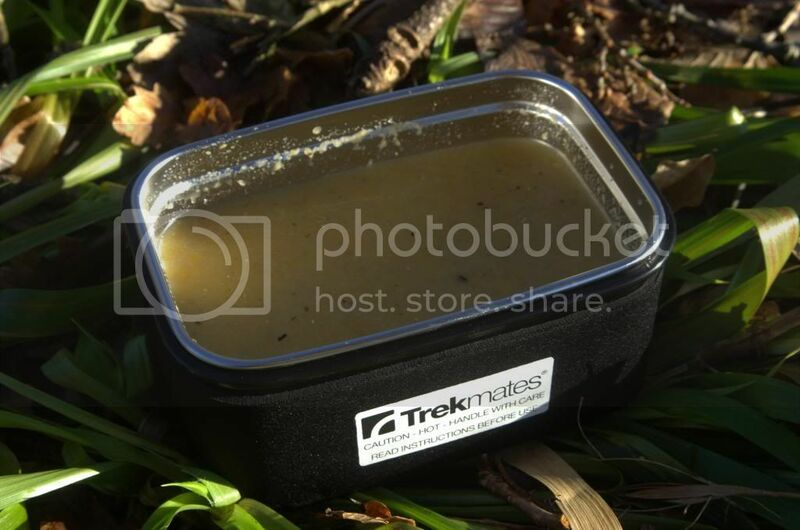 Opening the Flameless Cookbox you get the same impression as when you first look at a Trangia. 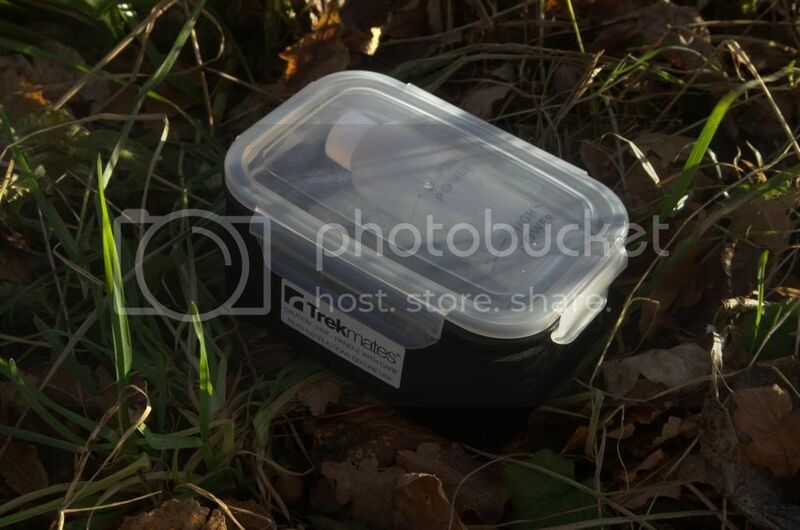 Neat, compact, self-contained and looking like a cross between a military mess tin and a modern clip-lock food container with. 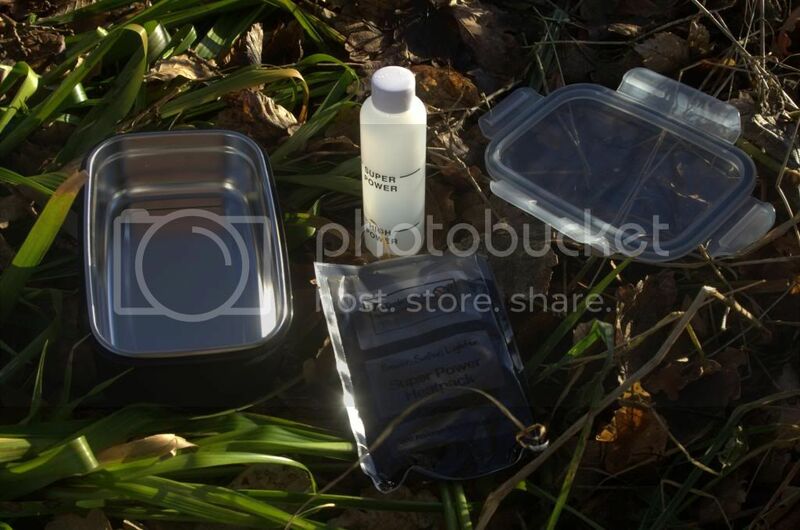 Within the outer plastic clip-lock container there is an inner 850ml stainless steel food container which firs very snugly, a water measuring bottle, two each of the Super High Power and High Power heat packs. On the outside is a nice black 2-3mm neoprene jacket to keep the contents warm and help the heating process. 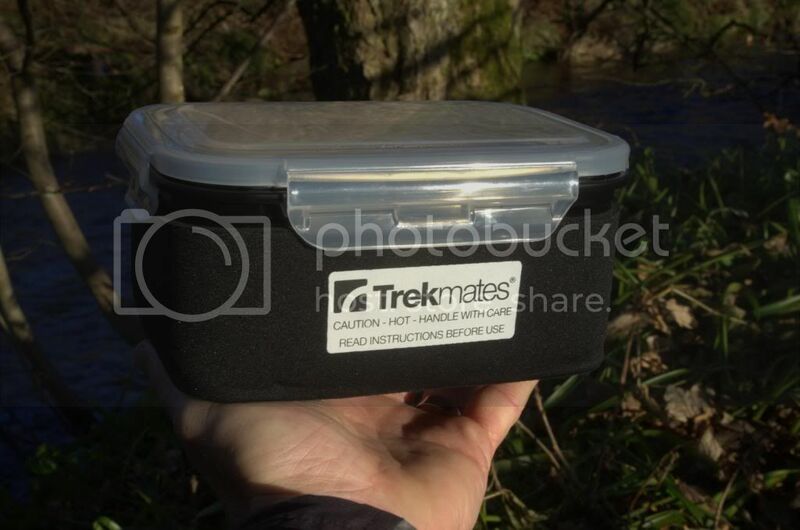 The Cookbox is a one person system with similar capacity to a Trangia 27. The idea is simplicity in its self in that you have a sealed chemical package which uses basic chemistry to produce an exothermic reaction with the addition of water. The instructions for ‘cooking‘ or re-heating your meal are simple and pictorial. There are details of the temperature profile over time included which I imagine will be ideal conditions. The Super High Power packs promise 90°c after 15mins and maintaining at that temperature for 15mins with the High Power packs reaching 65°C after 10mins and lasting for 20mins. As usual the best way is to test using real food in the wilds. 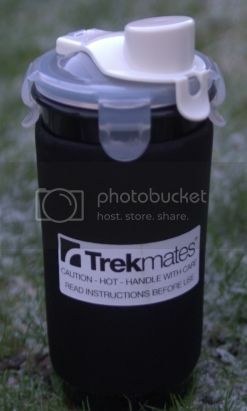 First time I tried it was on a local walk in the Campsie Fells with the air temp being around -2°C. A tub of thick homemade soup seemed like a good real life test. Using the measuring bottle I put the water (100ml) into the base containing the Super High Power pack and almost immediately the warmth could be felt. 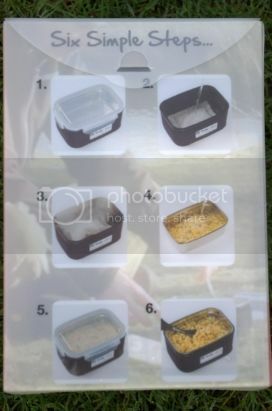 Place the stainless food tub on top with the soup already in, clip the lid on and wait as the steam escapes from the lid. The instructions do mention to be aware of this. After 10 mins I opened it up to stir the soup and take the temp which was at a very respectable 70°C. At 15mins it had got to around 80°C which I thought was quite respectable considering the sub-zero ait temperature. This was still plenty hot enough for reheating food to eat and too hot to eat straight away. The beauty of this system as well as the safety aspect is that it can sit straight on the tent floor or your lap as the neoprene jacket insulates well, only being 38°C on the outside base. Also with the heat pack in the base, the food keeps warm for a long time. On a subsequent test I tried the High Power heat pack which in the same conditions only raised the soup to around 50°C which was warm but not hot. If it was a summer day with air temp being 20°C higher the High Power pack would be fine. I have also tried boil in the bag rice and pasta, both of which appeared to cook fine at around 80-90°C with the sauce added in after 10mins. A nice added extra is the Cookbox makes a great hand warmer! 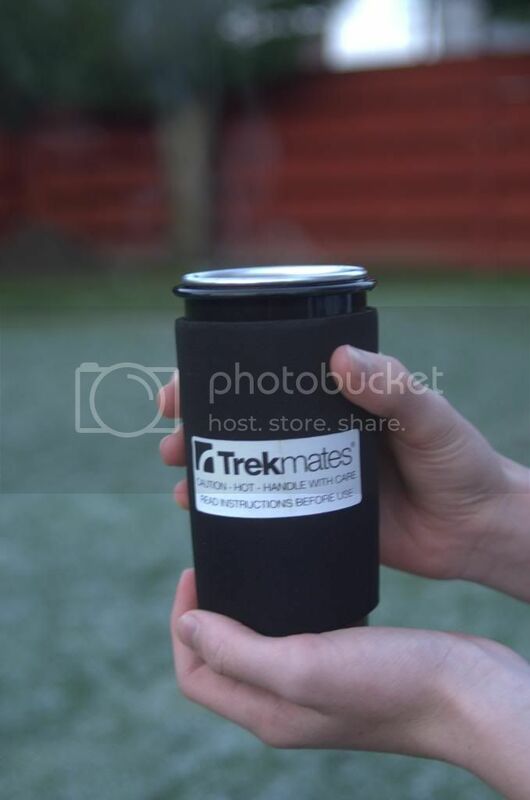 The Flameless CookFlask is more akin to the plethora of insulated mugs that are readily available in the shops these days with the big benefit of being able to make the hot drink fresh and keep it warmer for longer. 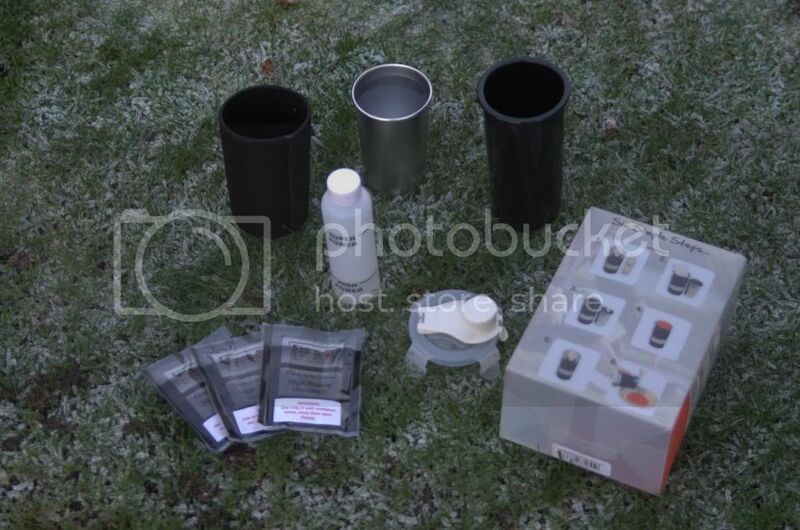 In the box is a 300ml stainless cup/beaker which fits into a plastic outer with a clear plastic clip lid. This clip lid also has a sealable drink spout with a neat flip closure. 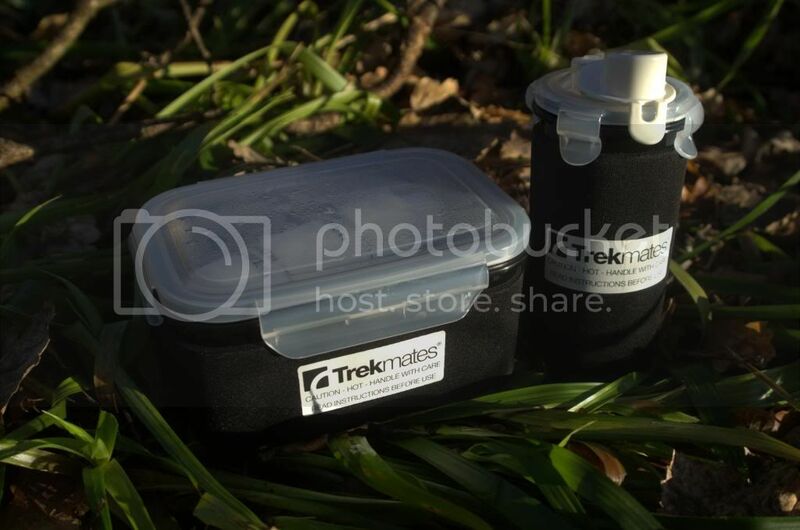 On the outside is a neoprene sleeve which unlike the Cookbox, does not cover the base. 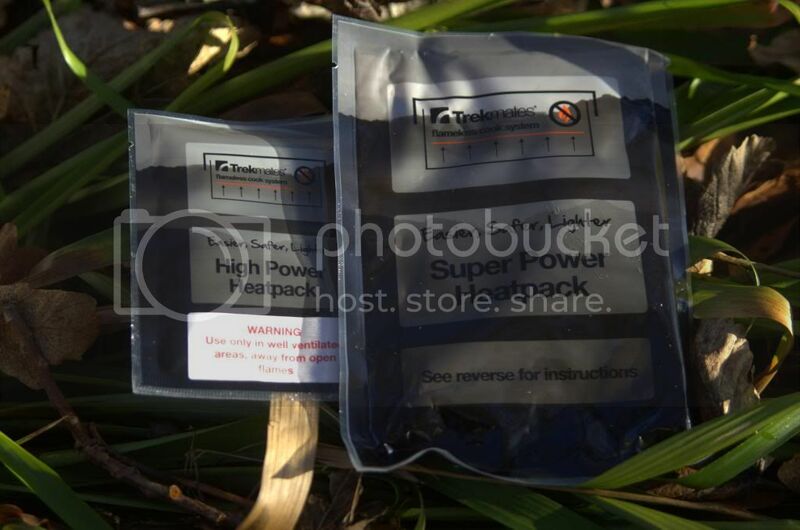 Also included are three High Power heat packs. As to the operation, the High Power heat pack is used with the stated figures being 80°C after 8mins and 90°C after 12mins staying above 70°C to 30mins from start. I tried this one along with fresh boiling water in a metal insulated cup to see the difference on a fresh, windless cold day (-2.5°C). The same process as for the Cookbox but as using the High Power heat pack it only required a small amount of water to the lower mark (40ml). At the moment I’m looking for a 50ml bottle that will fit in the flask to allow it to be a self-contained unit rather than having the standard bottle which does not fit inside it. Anyway, the water got to 80°C in 10mins at which point I put the tea bag in and closed for a further couple of mins. Got to 85°C max then decreased slowly once opened to the air to 58°C after 20mins, not bad when compared to the insulated mug which was at 49° at the same point after filling with boiling water. For the weight freaks amongst you here are the vital statistics…. 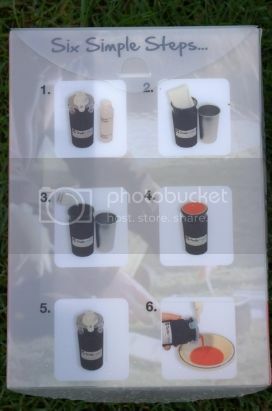 Overall a great idea aimed squarely at the safety conscious and DoE participants where the use of naked flame cooking in or near tents has certain problems. They certainly surprised me at their heat from the chemical reaction in the packs. The company does not give away the formula for its Heat Packs, but it’s likely to be based on calcium oxide, which when mixed with water produces heat and calcium hydroxide. Whilst I’ve not been canoeing since I got these in December, they open up the possibility of hot food ‘on the go’ so to speak without the faffing around with landing and lighting a fire!! At the moment I keep them in the car for emergencies. Down sides, I suppose the obvious one is the cost of the fuel, at around £10 for 5 Super Power Heat Packs or 7 High Power Heat Packs that works out at £2 per meal or £1.40 per drink. Not cheap when compared to gas or meths but where you would use them, that is not the issue. Overall I was quite impressed with the performance in the cold conditions and the quick, simple process for heating food. Would I use these in preference to an open fire or stove when I had the choice, no. However as mentioned previously they open up the possibility of hot food and drink in hitherto impractical situations and the big benefit of safety in tents.